Our fluffy campaign mascot the Let's do it for ME! Bear first met young starlet Jessica Daley during her time in BBC talent show 'Over the Rainbow'. They became firm friends and Jessica now helps him in his quest to raise awareness of ME whenever she can. Bear was delighted to visit Jessica in London again recently. Their mission: to raise awareness of ME once again! Bear didn't know it but he was in for a real treat.. since his last visit Jessica has successfully graduated from Arts Ed and secured her first West End role. She's now starring in the award winning musical Mamma Mia! as Ali. It was a first for Bear to experience the extravaganza of a West End musical and with such a hit-filled uplifting show he hasn't stopped singing and toe tapping since. 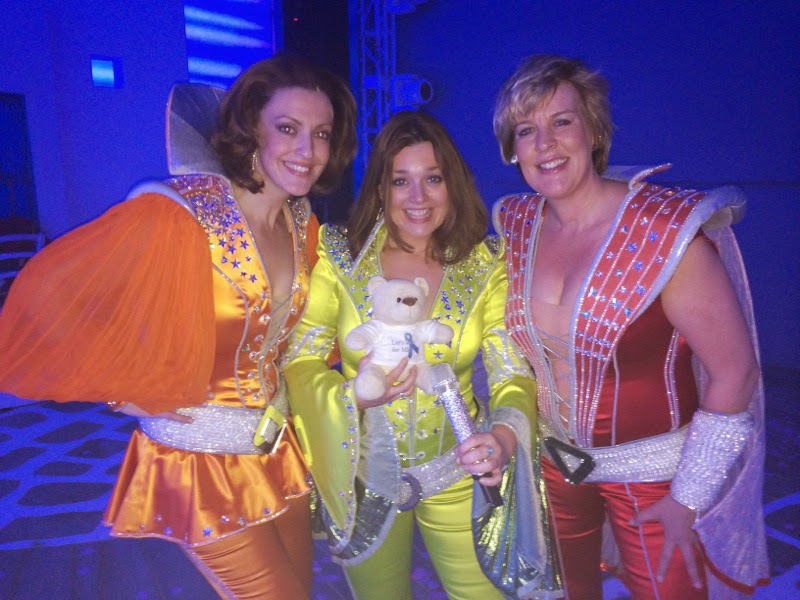 While Bear is no old pro (as yet) at attending showbiz events or rubbing shoulders with celebs he managed to keep his cool when introduced backstage to leading ladies Steph Parry, Dianne Pilkington and Jane Milligan (left to right) in their fabulous flared neon catsuits. Bear received a very warm welcome and a Mamma Mia! selfie to add to his awareness raising photo album - thank you ladies! 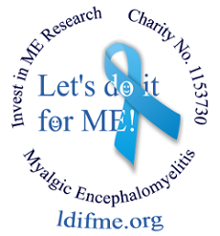 Some 250,000 people are thought to have ME or CFS in the UK – 25% are severely affected and 10% are children. Some are so severely affected that they cannot move, speak or swallow. Find out more about ME and our campaign here. Also see: Bear meets Emmerdale star Claire King and some of Andrew Lloyd Webber's favourite Dorothy finalists here. Bear was lucky enough to meet some of the lovely writers, directors and actors involved in making 'Many Happy Returns' a Dr Who audio play sold in aid of Invest in ME here.